There is nothing that can turn your day/week/month around quite like a stop at your favorite eatery. Whether it be a fancy steakhouse, a new modern café or your local bbq joint, there is just something about getting to enjoy your favorite place that makes all the noise of life fade away, even just for a moment. No matter what your favorite eatery looks like, one thing is universal about what makes everyone’s favorite place their absolute favorite—the food! It will come to no surprise to you, but here at HeartBrand our favorite places to eat all have one common ingredient—BEEF. Certified Akaushi beef, to be exact. As beef loving Texans we can’t get enough of our beef. Steaks, burgers, fajitas, bbq, even jerky (that can be a meal, right?) are always on the menu at our favorite places. So, what makes the meal at your favorite restaurant so good? Beyond the fact that you don’t have to do the prep work, or cooking, or dishes, the answer is simple—quality ingredients. 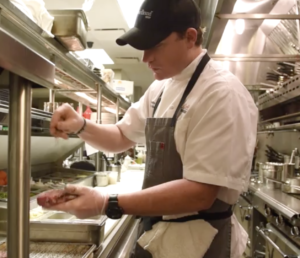 HeartBrand Certified Akaushi Beef is proud to work with top chef’s across Texas to provide the best beef eating experience possible for their patrons. “I set out to find two things a beef program that I could stand behind, that really had integrity. And two, I was searching for the best steak…that was a cut above everybody else’s,” said Chef Austin, executive chef of Hubbell & Hudson. Fourth-generation cattle ranchers Ronald and Jordan Beeman created HeartBrand Beef to revolutionize the beef industry by bringing exceptionally delicious and healthy Japanese Akaushi beef to American consumers. HeartBrand is involved in every step of the process, from ranch to table, ensuring that our beef is both the best-tasting beef in the world and the healthiest beef you’ll ever eat. HeartBrand’s Akaushi Beef is both tender and delicious as well one of the healthiest sources of protein you can eat. The great taste and health benefits are unique to Akaushi cattle, so the Beemans have worked diligently to maintain and protect the Akaushi breed. HeartBrand produces source-verified Akaushi beef under rigorous quality guidelines and certified product testing. Next time you head out to your favorite restaurant, check and see if HeartBrand Akaushi is on the menu. We are sure, Akaushi will give you the best eating experience possible.